HELLO SINGAPORE! 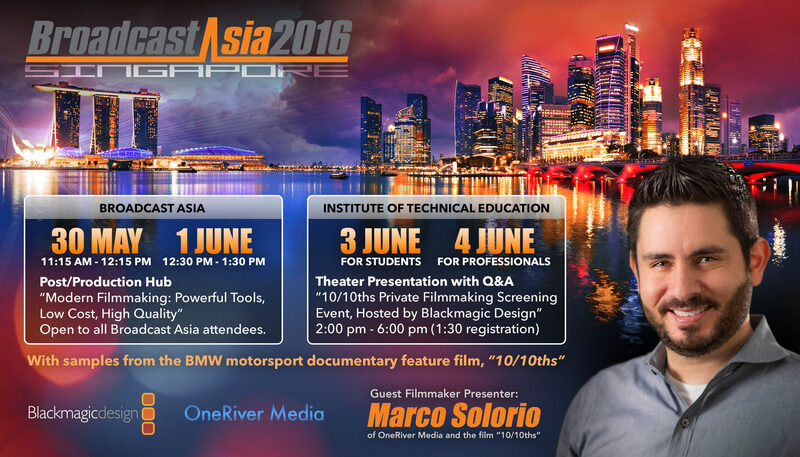 Marco Solorio of OneRiver Media will be presenting at Broadcast Asia on May 31st and June 1st and again at a special filmmaker event at the Institute of Technical Education on June 3rd and 4th, hosted by Blackmagic Design. 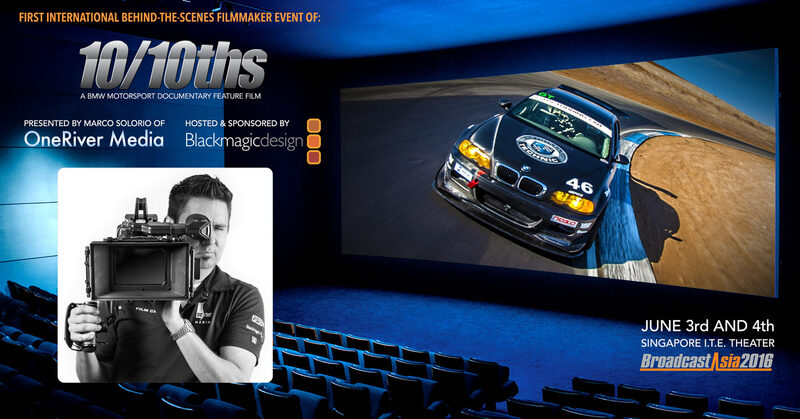 These four days will be jam-packed with exciting new presentations by Marco Solorio that go behind-the-scenes on his 2-hour BMW motorsport documentary feature film, “10/10ths” and shows how YOU can step into feature filmmaking. May 31, 11:15 am – 12:15 pm. June 1, 12:30 pm – 1:30 pm. Filmmaking has always been a problematic combination of high-budgets, large crews, expensive gear, and lengthy post-production. That frustrating day is finally over. Feature filmmaker, Marco Solorio, will show how you can step into the world of digital cinema, affordably and quickly, using extremely powerful tools with incredible quality. 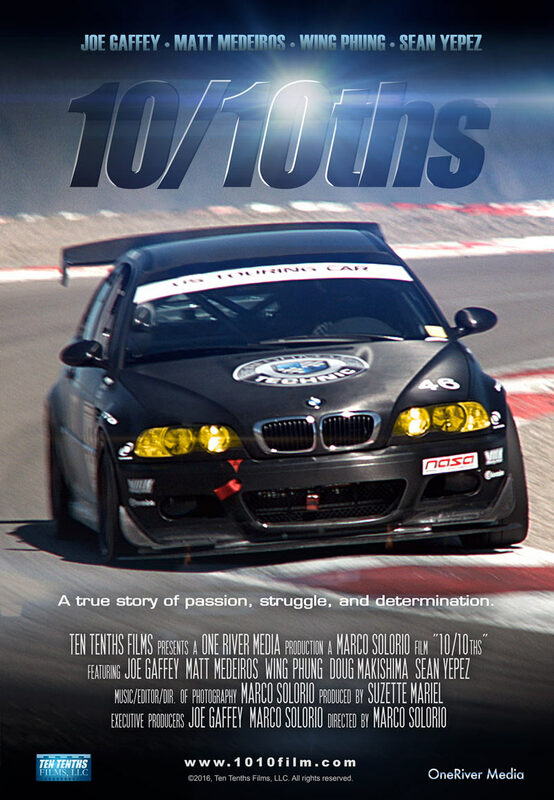 With examples from his 2-hour BMW documentary feature film, “10/10ths”, Marco will show how he created this film from beginning to end, as the director, cinematographer, editor, music composer, 5.1 audio mixer, and color grader. Your day of affordable high-quality digital cinema production is here! Feature filmmaker, Marco Solorio of OneRiver Media, travels from California to visit us for this private event, where he will present samples from his 2-hour BMW motorsports documentary feature film, “10/10ths” and show behind-the-scenes footage and explain how this film was produced with high-quality acquisition as a primary focus while using low-cost tools to save on budget and time while expanding flexibility. Marco will also show how these tools evolved over time through the 3-year process of the film production. Post-production workflow will also be covered, from editing, visual effects, audio mixing, and grading. There will also be many exciting raffles, including copies of Marco’s book, “Rigging Your Cinema Camera”, as well as cool products from Blackmagic Design! The event will conclude with Q&A from the audience. Suzette Mariel (Producer of 10/10ths) will also be present for attendees to get their questions answered, especially in regard to her role in the film and her perspectives on the feature filmmaking process. SEATING IS LIMITED FOR THESE THEATER EVENTS! BE SURE TO REGISTER TO GUARANTEE YOUR SEAT! This event is exclusively for students (of any educational system). Marco will help show students how they can transition from film student to filmmaking professional. If you have any interest in the filmmaking process, then this is a must-go-to event! This event is exclusively for professionals of the video and filmmaking industries. Industry professionals MUST register to attend the June 4th event.